3 Back Stretches for Desk Workers - Solutions Northwest, Inc. While every office admin should consult with an ergonomics consultant to ensure the workstation is properly set up, prolonged sitting at your desk may still lead to workplace injury if you do not properly care for your body. Beyond making sure to take breaks by getting up and moving, try these 3 back stretches our ergonomics experts have collected from the CCOHS. Sore back from hunching over a computer screen? Hold your left arm with your right hand, right above the elbow and gently push your elbow toward your right shoulder. Hold this stretch for 5 seconds and repeat with the right arm. This next stretch is great for your back and side aches: Interlock your fingers and lift your arms over your head, be sure to keep your elbows straight and slowly lean the left and then to the right. In a similar way, you can also bring your arms in front of your body, or behind to stretch the shoulder blades and chest. A back curl stretch will stretch your mid back as well as your legs. To do this stretch, grasp your shin, lift your leg off the floor and bend forward (curling your back), reaching your nose to your knee. Repeat with the other leg. Be sure to print these out and post them near your workstation for yourself or your co-workers. 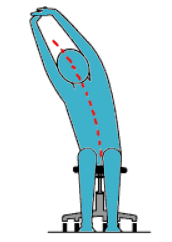 Staying proactive by stretching at your workstation is a great way to avoid workplace injury. If you are in serious pain, be sure to consult with your doctor to see if it is serious. And for more tips check out our blog featuring advice from our ergonomics experts. For an ergonomics consultation, visit SolutionsNW.com or Contact Us for more detailed information. Don’t forget to subscribe to our blog for more ergonomics tips from Solutions Northwest Inc., ergonomics consultants located in Washington State, Northern California (Arcata), Oregon, Seattle, Olympia, Tacoma, Kent, and Portland.